Fix Your Credit for Only $49.99 per month! CreditFirm.net provides the best credit repair service in America at an affordable price. $49.99/month! 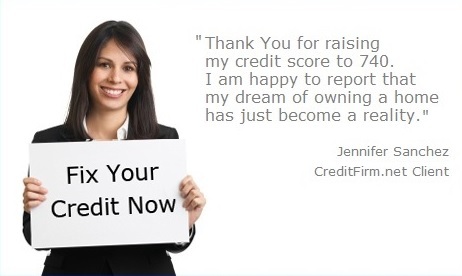 CreditFirm.net takes great pride in providing top notch support and the best credit repair service you can find. We have assisted over 60,000 clients, starting all the way back in 1997. CreditFirm.net has the right tools to make sure that your climb back to financial health is as quick and painless as possible. Sign up now, and be on your way toward better credit today! CreditFirm.net is a Professional Credit Repair Service with over 20 years of credit repair experience. We have deleted over 1,000,000 negative accounts from our client's credit reports and are consistently ranked among the top credit repair companies in the United States. Sign Up for our Credit Repair Service for Only $49.99/month. We contact the credit bureaus, collection agencies, original creditors, FTC, USDOJ, and initiate credit investigations, verifications, validations, and interventions into your accounts. It really is as simple as that, so what are you waiting for? Sign Up Now and be on your way toward great credit immediately!